The Economic and Monetary Museum was officially launched yesterday to showcase information about the evolution of the financial and banking systems in the Kingdom. The new museum, officially dubbed ‘Preah Sri Eysan Voraman Economic and Monetary Museum’, is located near the Central Market. Speaking at the launch, Chea Chanto, governor of the National Bank of Cambodia (NBC), said the new facility will document the role of NBC and the national currency, the Riel, throughout the nation’s history. He said the museum, which integrates the latest technology in its exhibitions, took nearly a decade to complete. “This museum significantly contributes to disseminating information regarding the history of the country’s economic and monetary policy. “It also shows in detail the re-birth of the Cambodian economy and the achievements of the government in the last four decades,” Mr Chanto said. 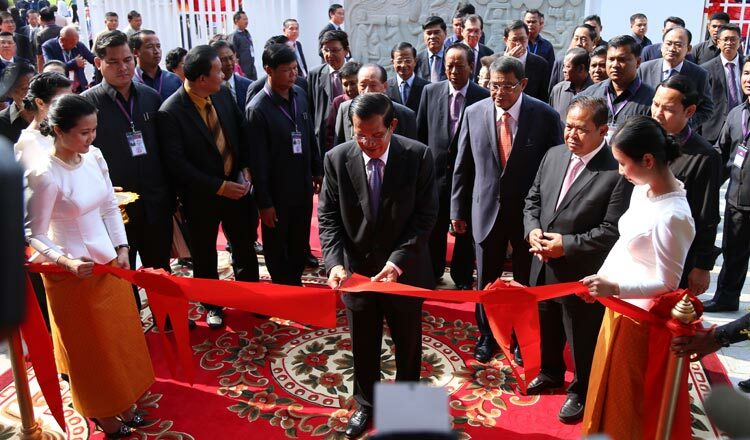 Prime Minister Hun Sen said the Riel has played an important role in the development of Cambodian society and economy. “The Riel plays an important role in our economy. In the last two decades, the presence of the Riel has increased remarkably in the economy and as a percentage of savings in the banking system, which reflects the trust of the people on our local currency,” he said. The premier said the museum will help people understand the history of Cambodian monetary policy, particularly the government’s plan to strengthen national identity by promoting the use of the Riel.